For the first time a Swiss research group has participated in the discovery of new chemical elements. The elements have the numbers 113 and 115 and were discovered by a combination of physical and chemical techniques in the Russian nuclear research centre (JNIR) in Dubna. With its radiochemical expertise the Paul Scherrer Institute (PSI) was central to the experiment’s success. Chemistry is currently pushing the boundaries of the scientific unknown. Until 1940 Uranium was the heaviest known element. This naturally occurring metal has the periodic number 92, as it has 92 positively charged protons in its nucleus. Since then over twenty elements with higher atomic numbers have been discovered. 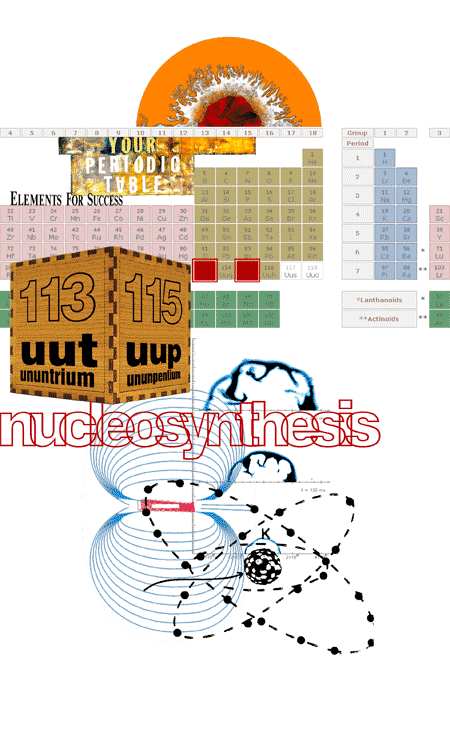 The birth of element 115 [ununpentium]: heavy elements decay by emitting charged helium atoms – alpha particles. Such decay chains were used by American, Russian and Swiss scientists to physically prove the existence of elements 115 and its decay product after emission of the first alpha particle – element 113 [ununtrium]. In order to synthesize the atoms of element 115 a rotating target disc of americium was bombarded with a calcium beam. In a fusion reaction between target and beam particles element 115 was born. However their formation was not sufficient to prove the element’s existence as its atoms only lived a mere tenth of a second and were difficult to detect. The radiochemical experiment proved much more successful as it yielded five times as many atoms. > nucleosynthesis. the process of creating new atomic nuclei from preexisting nucleons. > about superheavy elements. elements with an atomic number greater than 112, produced artificially in cyclotron experiments. > lawrence berkeley lab concludes that evidence of element 118 was a fabrication. 'finding superheavy element 118 would have been a giant step in the quest for the conjectured island of nuclear stability.' september, 2002.